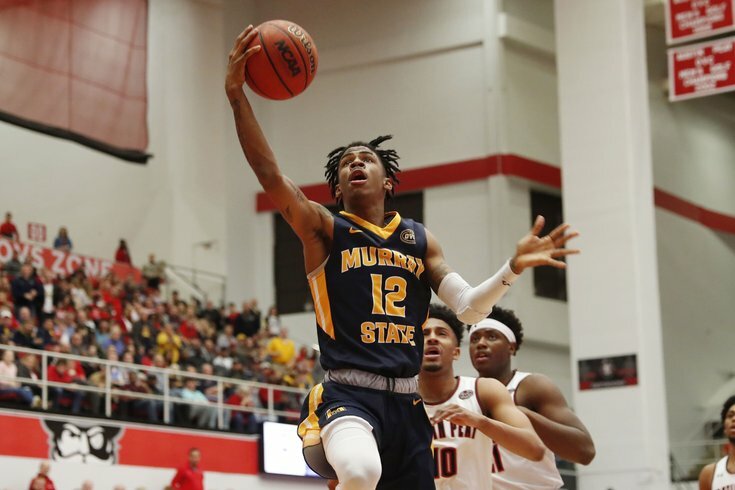 Ja Morant is one of the best players in the country and will be hunting for an upset this weekend. No one has ever picked a perfect NCAA tournament bracket. You won't either. But you also won't win your bracket pool or have a better March Madness season than your friends or co-workers without picking some upsets. On average, there are three lower seeds which are a minimum of five seeds below the team they beat (which means no 8-9 or 10-7 match ups) who win in the first round every year. There could be, and often are more. Since the NCAA Tournament expanded to 68 teams, with four play-in games, an interesting thing has happened. No. 11 seeds which play an extra tournament game have a better chance of advancing through a "first round" upset, (h/t The Ringer). Teams in the play-in round have a 55 percent chance of winning a round of 64 game, and a 27 percent chance of making the Sweet 16. This compared to 11-seed's that do not participate in the early round have a 42 percent and 18 percent chance, respectively, based on data collected since the expansion. This season's 11/11 play-ins include Temple vs. Belmont, and Arizona State vs. St. John's. We are picking the winner of Temple vs. Belmont because they face the weaker No. 6 seed in Maryland, as ASU and SJU would have to defeat one of the strongest mid major inclusions in years in Buffalo. The two squads are also very consistent on both sides of the ball and strong at large teams with upset potential. We could give you a whole song and dance about how the Racers have both a dominating offense and a suffocating defense, how they have won 11 straight games and were dominant in their conference. But really, we think Murray State is worth picking to upset No. 5 Marquette based on Ja Morant alone. The slam dunking guard averaged 24.6 points and 10 assists this season, playing his way into conversations as an NBA lottery pick. Against an over-seeded at-large team from a down Big East in Marquette (Villanova, the conference champion is a 6-seed), Murray State is champing at the bit for the upset win. The Aggies won 30 games in 2018-19. That's damn impressive. They also went nearly perfect in their conference with a 15-1 mark. They didn't shy from competition, nearly upsetting Kansas in the regular season. They have a pretty good upset resume. New Mexico state is one of the best rebounding and defensive teams in the nation, two things that are vastly important in tournament games where everything is magnified. The 5-seeded Auburn Tigers are an attractive team on the surface, but they haven't been good under the spotlight, losing twice to Old Miss, twice to Kentucky, to LSU, to Mississippi State and to Duke. They did, however, take care of Tennessee in the SEC Tournament final. All of those teams are admittedly much better than NMSU, but their track record in big games isn't reliable this season. The Anteaters (yes, you should pick them on their nickname alone) are among the best defensive teams in basketball. They are stifling without the ball, holding opponents to nearly 40 percent on two-point baskets. Heading into the dance, UCI has won 16 straight games. It's hard to not at least acknowledge that kind of momentum. According to Ken Pomeroy's rankings, UC Irvine is the top No. 13 seed, facing the worst No. 4 seed in Kansas State. His math says they are really a 6-seed. All of this conjures up the makings for an upset — if you're willing to take a risk on a very low-seeded team. And while you're at it, let's add to the madness with the Catamounts — another finalist in the all-nickname bracket. We have this one listed last because, well, it's the least likely of our five. Vermont on its own merit has the skill and talent to pull off an upset, they are a very good defensive team and play with a slower pace — a feature that many upset teams are able to exploit against better teams that play at a faster pace. However, up against the No. 4-seeded Seminoles from Florida State they may be over matched. FSU went 14-1 down the stretch and made it to the ACC final against Duke. Vermont is a team to watch, but so is FSU, so take a risk but beware on this one.